I went through the whole ‘sorting through patterns available for Parkas’ thing a while back. So here’s an overview/recap similar to my trench coat inspiration post as a launchpad for other sewists looking to sew parkas (is this the same thing as an anorak? It seems the same to me-i.e. raincoat-y but not made of raincoating fabric and less structured than an actual trench). Any of the above would’ve worked but I wasn’t in the mood for grading so.. These were pretty cool too (particularly the first one) but were avoided for the same reason as the others. 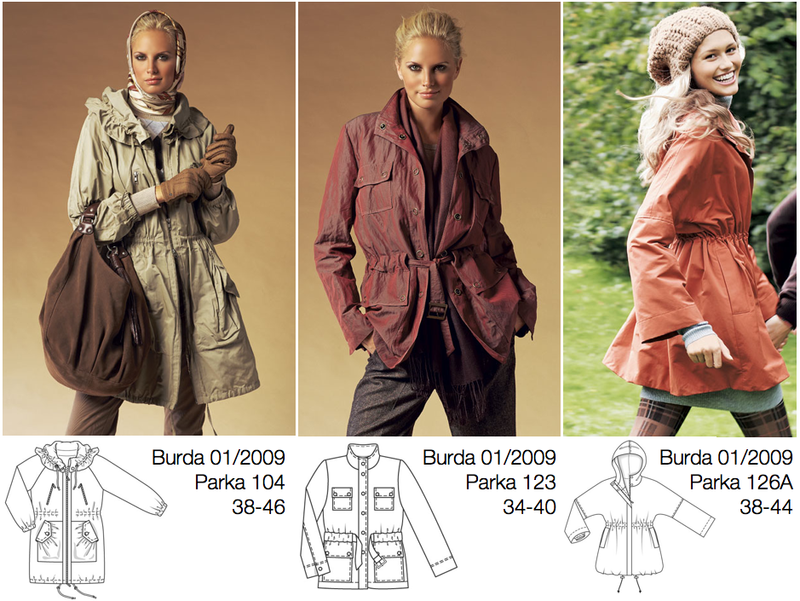 The Burda Easy ones didn’t need grading but were a bit too plain. The smirk on Scarlett Johansson’s face-I wanted to sew up that pattern just for that (and the collar and pockets). But I didn’t want to have to grade it down to my size. I’ve had this cut out and ready to go for a few months now (the zipper took a month to arrive from the US and I only found the waterproof seam sealant last week). I plan to add mini (usable) pockets inside the large external ones and omit the elastic. I’ve come across two other cool parka patterns since: The one on the left has nice simple lines but no hood. I still have some waterproof fabric left so I’ll probably make the one on the right at some point (once I’ve graded the pattern down). All the burdastyle/ burda world of fashion patterns can be viewed as full magazine browse-throughs on the French site and pdf versions for most (if not all) of these should be up on the burdastyle shop by now. 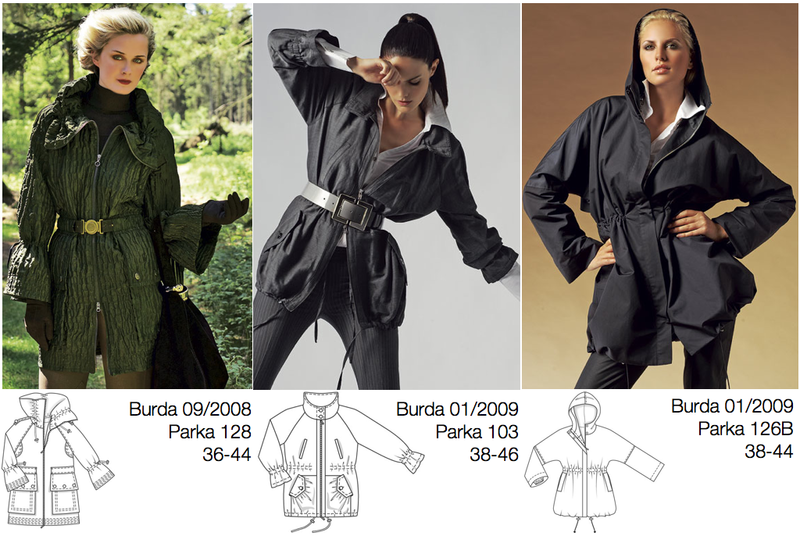 There’s also a couple of parkas in burda’s FashionLine set of patterns (available as both envelope patterns and downloads-Stef kindly picked up this one for me). Both of these (regular, plus) downloads are cool too. Disclaimer: All images remain copyright of their original owners and are used here for the purposes of illustration and discussion.